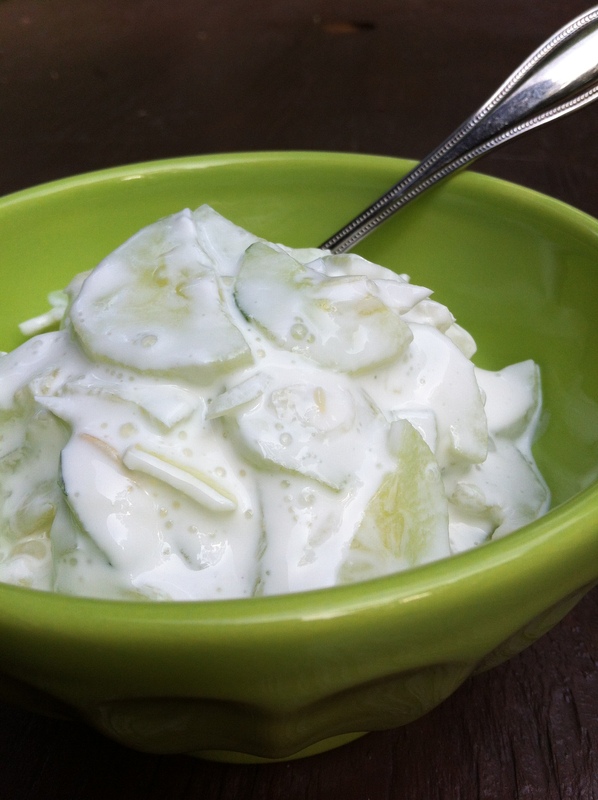 Cucumbers in cool sour cream; so simple and refreshing! This recipe has been in our family going back to when I was a small child. It somehow became a Christmas tradition and my Aunt Janis makes it every year. We really enjoy it in summer when the cukes and onions are plentiful and we can sit down and eat a whole bowl full! Peel cucumbers and slice very thin. Sprinkle the spoonful of white sugar and gently mix, set aside. Slice the white onion very thin and mix in with the cucumbers. Whisk the sour cream and white vinegar together, add salt and pepper to taste. Taste the dressing; it should not be overly tart but should have a slight tang to it from the vinegar. Add more vinegar if you can’t quite taste it. Mix the dressing in with the cucumber/onion mixture and put back in the fridge for a few hours. Mix before serving and enjoy this refreshing dish! I have been carrying around this recipe for about a 5 months, patiently waiting for the blueberries and the kohlrabi to be in my fridge in the same week. I must confess, after all that waiting I really had built up quite an expectation for this recipe! After making it this week, I debated on whether to include it or not. It was very interesting but I was not blown away. But wait… the next day I ate the leftovers and now I am obsessing about whether there will be kohlrabi at the pick up this week so I can make it again! Absolutely delicious and gets super high marks for being a fabulous leftover and make-ahead-friendly dish! Toast the almonds in a preheated oven at 350 for 8-10 minutes, checking to make sure they don’t get too dark. Pull out and cool on a separate plate. Whisk the dressing ingredients and set aside. Thinly slice the kohlrabi with a mandolin or cut into matchstick size pieces and place in a medium size bowl. Thinly slice the fennel, coarsely chop the almonds and add both to the bowl. Pour in the dressing and toss to coat. Add the blueberries, goat cheese and mint, gently mixing them in, being careful not to mash the berries. If you can wait until the next day to eat it you won’t be disappointed! You can toast the nuts days beforehand and store them in a plastic baggy. The dressing can be made ahead, as well. 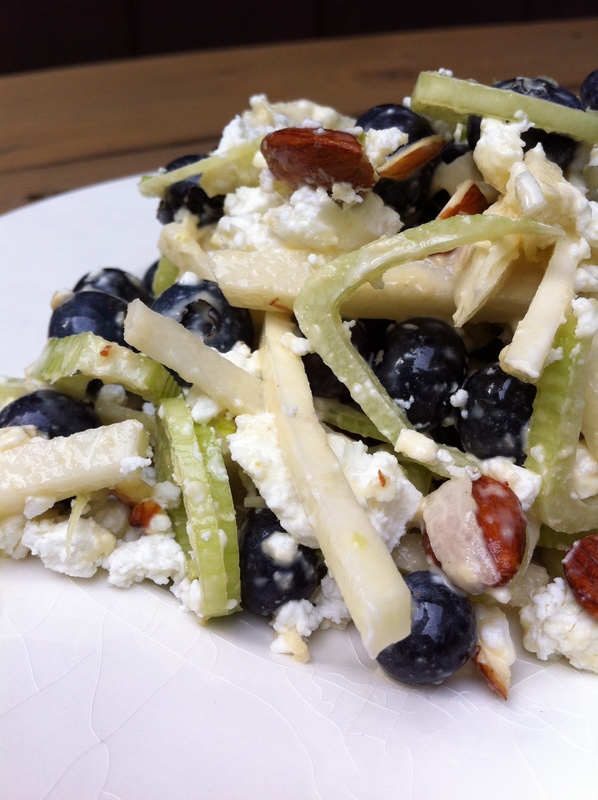 This entry was posted in Blueberries, cucumber, fennel, kohlrabi, mint, White Onion and tagged cucumber salad, Kohlrabi, kohlrabi salad. Bookmark the permalink.